Dan Farnworth, Emergency Medical Technician with North West Ambulance Service, co-founded the charity Our Blue Light. Unions, professional bodies and charities will come together at The Emergency Services Show 2017 at the NEC in Birmingham next week (20-21 September) to lift the lid on mental health issues and share strategies for improving the wellbeing of emergency services staff. A recent ‘blue light’ mental health survey by the charity Mind, showed almost nine out of 10 emergency service workers suffer some form of mental health issue and more than one in four have thought about ending their lives. In the new Health & Wellbeing seminar theatre at the show, visitors will hear personal stories from emergency responders who have experienced such challenges, and from those who are implementing change. Dan Farnworth, Emergency Medical Technician with North West Ambulance Service, will share his experience of mental health issues, which resulted directly from an incident he attended. 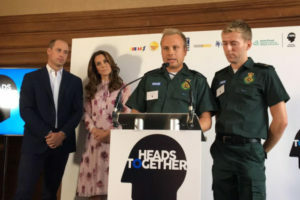 He has since co-founded the charity Our Blue Light and is helping to pioneer new ways to support and improve the wellbeing of emergency and essential service employees. Drawing on his personal experience of a significant nervous breakdown, Chief Superintendent John Sutherland of the Metropolitan Police will look at understanding the personal impact that police work can have on those who serve. Delegates will also be updated on Oscar Kilo, the blue light wellbeing framework for all emergency services being developed by The College of Policing, in conjunction with Public Health England. Chief Constable Andy Rhodes of Lancashire Constabulary, who initiated the framework, said, “Wellbeing is often just received as a ‘nice to have’ or an ‘add-on’ and not something that is, or should be, part of daily business. We need to get the message across that ‘it is ok not to be ok’ and it’s up to leaders and line management to do this. Faye McGuinness, Blue Light Programme Manager at Mind will share useful ideas and tips on how to improve mental health and workplace wellbeing within the emergency services. Attendees can also learn how Humberside Fire and Rescue Service has implemented a Blue Light Time to Change pledge to end mental health stigma and discrimination in the workplace. Simon Durance and Gary Hayes, co-founders of the charity PTSD999, will present a session entitled Time to Man Up. A former solider and police officer, Gary Hayes served on various different cases most notably the mortuary during the 7/7 bombings. He subsequently lost his job in the police force due to Post Traumatic Stress Disorder (PTSD) and very nearly lost his family. Co-founder Simon Durance, a former solider serving predominately in the Balkans and Northern Ireland and a former close protection officer to the stars, suffered with PTSD for over 20 years, and tried to take his own life 10 years ago. Together they will talk about living with and surviving PTSD. Further advice on health and wellbeing can be found around the exhibition where visitors can speak to The Police Federation of England and Wales, Mind, The Fire Fighters Charity, Fire Brigades Union and Alzheimer’s Society, among others. Visitors can also find out more about ComBrick Relief, a collaboration of Lego Twitter groups, supported by Mind’s Blue Light Programme, which use Lego to ‘de-stress for the front line’. Free to attend, The Emergency Services Show enables visitors to see and handle the latest kit and speak to leading training providers. It features over 400 exhibitors, live demonstrations of vehicles and equipment and a full programme of CPD-accredited seminar. Entry to the exhibition and seminars, as well as parking, is free. The NEC is linked to Birmingham International Station and Birmingham Airport and is directly accessible from the UK motorway network.